This story originally appeared in the Winter 2015 issue of Preservation magazine. 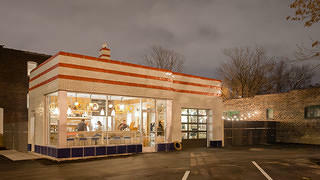 When architect Brent Crittenden purchased a former Standard Oil filling station in St. Louis’ Botanical Heights neighborhood in 2010, it was “a disaster,” he says. The 1930s-era Art Deco building underwent an extensive renovation, down to the red accent bricks specially fabricated by a local mason. 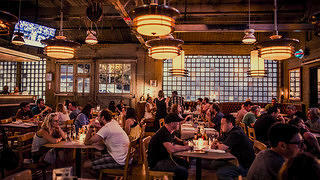 It reopened in November 2012 as Olio, a wine bar and Mediterranean-inspired restaurant. The station’s original back wall, featuring a historic steel-sash window, is still intact, as is the original garage door. Olio chef/owner Ben Poremba estimates that the restaurant’s wine menu features about 200 selections, along with 16 beers and an assortment of historically researched cocktails, which nicely complement Olio’s seasonal, locally sourced cuisine. The egg salad is a perennial favorite. The former tire shop that houses Parts & Labor, a combination butcher shop and restaurant in Baltimore’s Remington neighborhood, was actually “in pretty good shape” once the decades of accumulated tires were removed, says owner Spike Gjerde. A year-long renovation and restoration was funded in part by the National Trust Community Investment Corporation and included almost two months of work on the brick exterior (now painted rosy pink and olive green). Parts & Labor opened its doors—and its hearth—this past spring. All of the signature meat dishes are cooked over an open flame in the restaurant’s 9-foot-tall fireplace, built of soapstone and reclaimed cobblestones. Gjerde recommends a seared meat dish called Pride and Joy, featuring pork and organ meat with a spicy glaze, wrapped in lettuce. Vinsetta Garage, built in 1919, was one of Detroit’s most beloved auto repair shops until closing in 2010. When Ann Stevenson and her restaurateur partners decided to open a restaurant in the former garage building, their goal was to mirror the quality of service that generations of Detroiters had experienced within its walls.